I suppose that common sense isn't so common after all. 1020 is the still the best camera phone in WP and probably in the market so I am expecting proper camera updates and I don't care about MS resources etc. I care only about actual support on things that for sure can be done with the existing processor. But since some of 1020 owners just buy the MS BS then I suppose that we will get the support that we deserve. And WP they will get the market share that they deserve as they do. PS. Except for the 1020 I have a Dell laptop, an Acer W700 tablet and a Toshiba Encore 2 tablet all running W8 but I won't stop complaining when MS or any other company treat me like ****. Please read my signature and take it to heart. You are so centered on "I" that you have lost touch with reality. I'm truly sorry about how you feel. Why not buy the best photo image processing software, off load from the 1020 and run rings around what is presently available from MS no matter what processor or model known to the market. Worth noting the 1020's camera algorithms were tweaked and such with Black, etc. The phone had its "proper camera updates." I'll just leave this here... since I think I've said all I felt I could. ...Denim in order to create folders, to snooze my alarm etc! What kind of folders do you want to create? Folders for apps in main screen? Already there. Snoozing your alarm, already there. You can even choose how much do you want to snooze, 5 minutes, 10 minutes, 20 minutes, 30 minutes and even an hour. I took a screenshot for you. 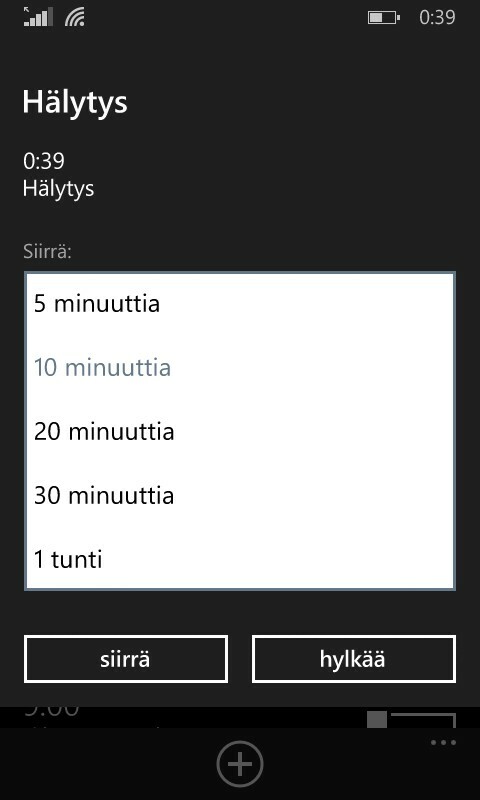 Sorry about the strong encryption otherwise known as a Finnish language. Please read my signature and take it to heart. Well I agree that your signature really characterizes you so good choice! I am done here. I wish all of you good luck with your MS stocks. If it is business as you say then it is bad business because obviously they only have around 3% worldwide and honestly the 1020 was my first and last Windows phone. As for the "1-2 years old phones still getting updates" argument let me just say that that the updates that they are getting are things that other OS had 4 years ago so it is really a joke. Just imagine that still in 2015 I am waiting for Denim in order to create folders, to snooze my alarm etc! The 1020 is still their flagship camera phone and until they introduce another camera flagship they should have made proper camera updates to the camera to keep the owners happy. But anyway as you said it is just business so good luck to MS and to their rather pathetic 3% market share. And well now you have those features the others had four years ago. Mobile data toggle, battery saver toggle and live folders are actually pretty handy to be honest. I have a Lumia 1020,I'm selling mine to get 930 because of camera improvements and faster app switching(like switching back to Skype especially for me),I know its cause of hardware restrictions that Lumia 1020 wont get improvements,the 2gb memory it has is to assist with image processing,because it doesn't have a image processing module like 808 pureview, what I seriously think happened which screws us 1020 users is the launching of the device timing,its like they wanted to meet some deadline ,it was launched in July 2013 BUT then soon after the 1520 was released with power specs in October 2013,we don't know who made the decisions but it screwed things,okay lets say you wanna launch similar phone to 808 pureview in windows phone,and then release phablet version (1520)with slightly lower specs in camera dept(20 instead of 41),why launch without snapdragon 800 which the phablet uses?,someone made mistake in their team then launch phablet version soon after with power specs,the child of the phablet came way after in 2014,they had time restrictions set and didn't want to launch both phones same time to hinder sales of other but its sad that mistake was seen after 1020 launch,July to October is 4 months apart,think about it guys. The 1020 hardware couldn't support Rich Capture. Sure. Fine. It's true. HOWEVER, don't try to convince anyone that they couldn't have added at least an HDR mode to the Nokia Camera. The 1020 CAN support HDR, as proven not only by the countless 3rd party apps but also by the existence of HDR in any Android smartphone from the same time and specs of the 1020. Microsoft DID abandon the 1020. There's no way around it. And they did without releasing a new imaging flagship. It's their decision and not one I'm surprised. I knew they'd f*ck anyone not using a phone released by Microsoft Mobile (ie x3x series). They always axe everything existing when they buy stuff. Skype must be the only exception. Worst of all, as Windows Phone is completely locked down, you can't even get an easy way to root it and make it so that you can replace the Nokia Camera/Microsoft Camera with a third party app which, by now, are better for the 1020 than the Nokia Camera. HOWEVER, don't try to convince anyone. Microsoft DID abandon the 1020. There's no way around it. And they did without. Oh dont talk about completely locked down,you know what the OS features so why talk about it.if you wanna root stick to Android. The OS features the ability to determine a camera app to use...as long as it's either the Nokia Camera or the Microsoft Camera. That's a stupid restriction that isn't necessary and shouldn't exist. Therefore the OS is locked down. Period. Root on Android is the positive thing that lets you fix when the OEM or Google messes something up. If Microsoft allowed it on Windows Phone as they do on Windows, the platform would have advanced a lot more in these last 4 years and marketshare wouldn't be decreasing. I knew they'd f*ck anyone not using a phone released by Microsoft Mobile (ie x3x series). They always axe everything existing when they buy stuff. Skype must be the only exception. Not adding specific camera features is a pretty narrow definition of "abandonment." I haven't heard of too many phones getting camera algorithm stuff after launch, so by that definition, most phones have been abandoned already. The 630? Nope. It must be abandoned. That last 8.1 Update + Denim update, adding an EQ? Abandonment. The 535, where they're trying to do something about the touch issues? Its not camera improvements. Abandonment. Abandonment is no updates, no nothing whatsoever. So dont be so melodramatic. I'm sorry, you're literally taking one data point. Are x20 phones not getting 10? That's not "f*cking" with people. not yet at least. Putting out updates for all those devices isn't trivial. I suppose people could go back and forth on that locked-down-or-no/more-secure-or-no, but I rather not touch that right now. but freedom goes all ways, not only the better. I am fine with discussing things. But this is getting a tad personal. Feel as though this has reached it's limit. Let's see how MS does with the L1020- which my daughter owns and loves- when the W10 update is released. Guytronic, Greywolf1967, JaniM and 5 others like this. One month with the Microsoft Band - Was it worth the effort?